Dames rocket looks (and acts!) a lot like honesty: a tall, introduced, spring-blooming plant with four-petaled flowers in pinkish purple or white. However, the leaves of damesrocket are elongated and lance-shaped,with a slightly toothed edge. The seedpod is also very long and thin, not round like money plant. It blooms in mid-May, while honesty starts blooming earlier in the season. Dames rocket produces seeds prolifically, which is one reason why this Eurasian introduction is now considered invasive in many states. It gets a little help from American gardeners too: the flower continues to be planted and enjoyed for it’s beautiful bloom. 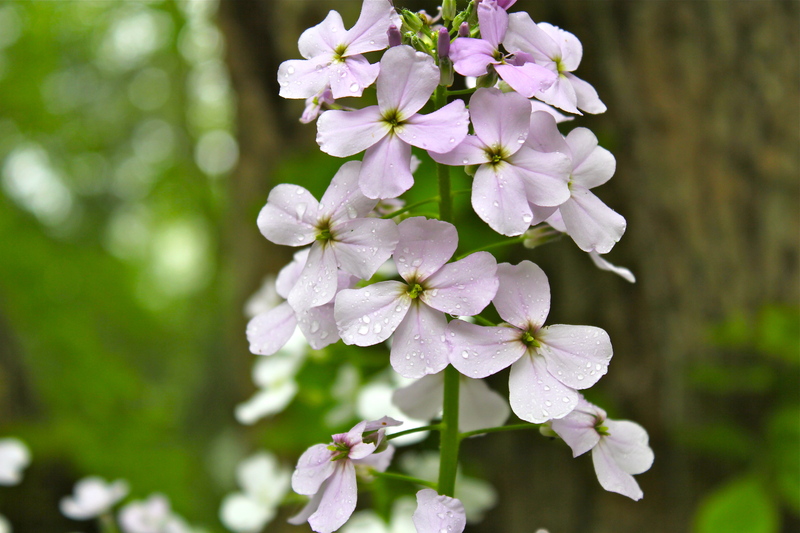 The genus name, Hesperis, is Greek for evening. The sweet scent of the flower increases at nightfall. What’s not to like about that?